Just getting started with morning meetings in the upper elementary classroom and looking for ideas and tips for how to implement them? Maybe you are considering including a classroom meeting in your school day or want to learn more about “morning meetings” and aren’t sure of the real purpose or where to start. Have you had morning meetings from time to time but are now looking for how to make your morning meetings more valuable and sustainable this school year? 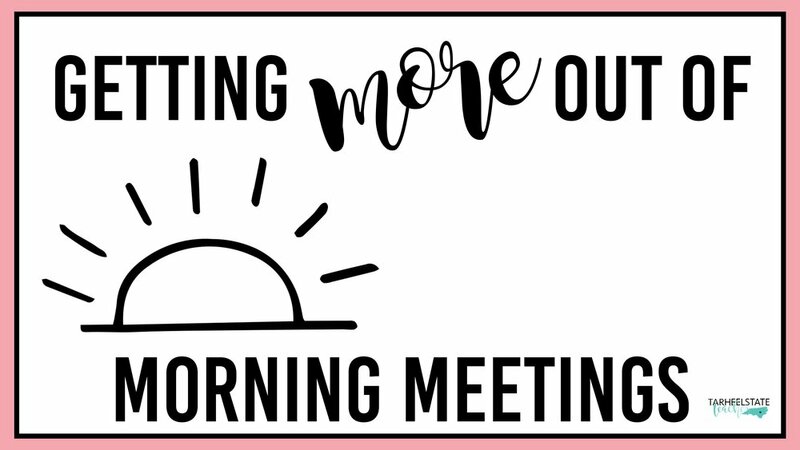 Or, have you run daily morning meetings in the past but are really looking for ways to spice them up, get more out of your classroom time, and make a greater impact on students and your classroom community? Well, if you are in any of those "boats," I've got something for you! I've been planning something exciting for Upper Elementary teachers to help us get ready for back to school----professional development in Morning Meetings! I'm super excited to announce that I'm putting together a 5-Day Morning Meeting PD to help you prepare for Back to School! The first year that I implemented morning meetings, I loosely followed the Responsive Classroom model. During that implementation, I soon fizzled out in my commitment to morning meetings after the "back to school" season was over. > > > It wasn't until I realized the power of THEMES-IN-LITERATURE-BASED morning meetings that I truly committed to daily morning meeting lessons. I felt that I could push beyond morning messages, greetings, and sharing sessions to take my students to a deeper level of personal development and classroom community building. And boy, teacher-friend, was I RIGHT! Theme-based morning meetings were LIFE-CHANGING for my self, my classroom, and my students. And, I'm excited to tell you all about them! This challenge will help you prepare your morning meeting PLAN OF ACTION. Plus, you'll get at least three themes to get you started with morning meetings and tips for finding more resources. READY TO JUMP IN and get your MORNING MEETING PLAN ON? Just drop your information in the fields below and you'll get an email each day for the next 5 days leading you through the challenge. So, how does an online challenge work? By signing up for the challenge, you will receive a FREE PDF guidebook to help you "Get MORE out of Morning Meeting." You will have BITE-SIZED assignments to think about before the daily online training and will fill in some of the information during the live trainings. Each day of the challenge, I will send you an email reminder about the topic of the day and any tasks you should complete. We will have a closed Facebook Group focused on Upper Elementary Morning Meetings where I'll post discussion questions and you can ask questions you have! I'll go LIVE on my Facebook page each day of the challenge to discuss a topic related to theme-based morning meeting routines. This challenge ran LIVE from July 23rd-July 27th, 2018, but you can do your own self-paced pd now! The videos can be found on my Facebook page, but you'll want to sign up for the emails because that's where you'll get all of these free resources that I share during the challenge! I've taught 4th and 5th grade, so this challenge will be geared towards upper elementary classrooms, but lower-grades teachers with interest in learning more about theme-based morning meetings and getting ideas for how they can take morning meetings to the next level may also be interested in the "Getting MORE out of Morning Meeting" back to school challenge. But guess what....I had teachers from Kindergarten through high school participate in this challenge and tell me how much they benefitted and gained new ideas for their classroom community from it! Are you super-excited, ready to participate in this MORNING MEETING challenge? If so, you will be empowered to take baby-steps each day that will move you closer to having a well-planned, purposeful morning meeting routine during back to school and ALL.YEAR.LONG!